Be sure to get your Disney Minnie Mouse with Flowers Statue by Romero Britto hot of the truck! Fill in the Notify me when Available and you will be the first on your block to have a Disney Minnie Mouse with Flowers Statue by Romero Britto !! From the Disney collection by Enesco. 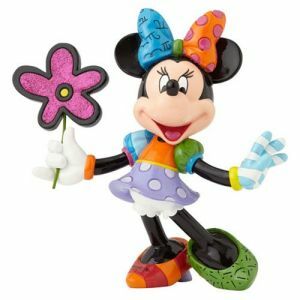 Disney Minnie Mouse with Flowers Statue by Romero Britto. The statue is made of stone resin and stands 8.25 inches tall.